According to new third annual InterNations Expat Insider 2016 survey report. Dubai and Abu Dhabi are ranked among the top 25 best destination for expats. Dubai ranked as the 22nd best destination for expats and Abu Dhabi proudly hold the 20th place. Both cities are ahead of popular tourist destinations like London, Paris, Hong Kong, Istanbul and Rome. 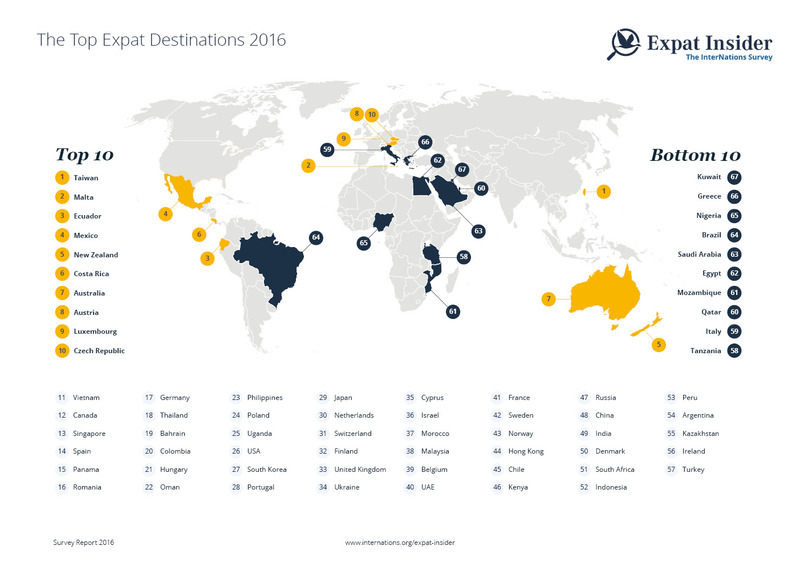 Where UAE as a country stands at 40 on the Top Expat Destination 2016 survey report. New InterNation research report that polled more than 14,000 expats living all around the world. It is one of the most extensive studies ever conducted to explore the general living situation of expatriates. InterNations is a huge global network and information site for people who live and work abroad. It has 2.4 million members in 390 cities around the world. Here are some categories in which Dubai and Abu Dhabi are ranked in good positions. The Survey finds out that quality of life for expats in Dubai and Abu Dhabi is far better then many top cities. Both cities, Dubai and Abu Dhabi, earned high approval ratings in Personal Safety with Dubai scored 63% and Abu Dhabi scored 64% of expats consider their personal safety is “Very Good”. Both cities Personal Safety ratings are much higher than the global average of 38%. The survey report also revealed that both, Dubai and Abu Dhabi, received high ratings for Political Stability as well. 51% of Expats in Dubai and %44 expats in Abu Dhabi voted for Political Stability as “Very Good”. Dubai and Abu Dhabi also been rated high for making it easy for expats to settled in. Dubai stands on 11th position while Abu Dhabi followed in the 12th position. Both cities also done well in the “Friendliness and Language” categories. Dubai ranked at 8th position for friendliness and ranked 6th for Language categories. 25% of expats living in Abu Dhabi said that the local population is very friendly. Though Middle East countries does well in the survey report, There are certain areas where these cities including Dubai and Abu Dhabi need to work on. Like expats living in Dubai and Abu Dhabi didn’t voted good for Leisure, Health, Travel & Transport and Personal Finances. Even Abu Dhabi, which does the best in the Middle East for quality of life overall, only makes it to a rather mediocre 17th place. So if you are living in Dubai and looking for employment opportunities anywhere else, think again. Dubai is working hard to make it one of the smartest city in the World. I am pretty sure that in next five or six years it will be rated among top 10 for sure.